With all the crazy stuff coming out of Washington these days it shouldn’t be surprising to hear a liberal congressman introduced a tax to address “climate change” that he claims is an investment in the future. But when it’s a Republican doing the proposing the matter’s worth a double-take. Such is the case for a lone RINO lawmaker representing a district full of Democrat voters. His latest attempt to save his own political skin makes a statement – and it’s not a positive one for conservatives. “’While there are still some deniers out there, most Americans today understand that climate change caused by human activity is a reality that must be addressed,’ Curbelo said at an event at the National Press Club. The time to act is now? I’m not sure you’d get many takers for Curbelo’s proposition – at least not in the GOP. For years Republicans fought Democrats – and among themselves – trying to assemble a tax cut package that would make everyone happy; it’s doubtful you’ll get many to go along now with imposing a new tax that would most definitely constrain business. Talk about shooting yourself in the foot, Carlos. It’s stupid. And defining what is a “healthy planet” is difficult at best and impossible at worst. The United States is scrupulously clean environmentally as it is; our children are already inheriting a country that’s mindful of taking care of our planet without bowing to crackpot scientists and wild theories advanced by liberals with a political agenda. Where did this carbon tax plan originate, the Sierra Club? Greenpeace? George Soros? Are you ready to chain yourself to a tree? Curbelo offers a carrot to the Trump administration in his bill by declaring that partial proceeds from the tax would be devoted to improving the nation’s infrastructure (it would also ditch the federal gas tax, therefore theoretically helping people). This is all well and good but there’s no possibility Trump would spend all his time building up American industry only to then consent to saddle business owners with a dubious tax on carbon emissions. Throughout his 2016 campaign Trump concentrated on issues that stirred and motivated the GOP base – namely immigration, strong national defense and cutting burdensome regulations. Needless to say, a carbon tax was not part of his platform then and there’s no way Trump ticks off his most loyal voters in advance of 2020. Politically speaking Curbelo needs to convince enough Republicans to commit political suicide and go along with Democrats to pass such a measure -- and then it would have to move through the Senate as well. Assuming political lightning struck and both Republican-controlled houses of Congress agreed to a new carbon tax, then it would require a Trump signature to become law. It’ll just as soon snow at the equator before such a thing would ever occur. Under a Democrat controlled government a carbon tax bill might have a reasonable chance of thriving. But with Republicans in charge? No. Even the GOP establishment leadership wouldn’t allow it to get off the ground. And can you picture Trump campaigning in Pennsylvania, Michigan and Wisconsin trying to sell the bill to his supporters? He’d lose everything… and for what? Curbelo himself certainly realizes the chances of seeing his idea enacted into law are slim and none, so therefore his carbon tax is nothing more than a naked political play to his liberal constituents to make them think he’s “doing something” and trying to help the poor at the same time. Curbelo’s might be a popular local idea in the Sunshine State but would the Florida congressman really wish to shackle American industry in far off places in the vague hope of halting or reversing the rise of the oceans (which is supposedly taking place in his district)? Will manufacturing heavy foreign countries similarly go along and agree to curb their own carbon emissions to possibly stall the effects of “climate change”? And assuming they don’t, how much overall environmental impact could Curbelo promise as the result of his tax? Would he also be willing to jeopardize the political fortunes of his entire party to pass a divisive tax? “Norquist's group [hosted] an event Monday to highlight conservative opposition to the bill, which is designed to tempt Republicans into supporting a tax on carbon emissions by getting rid of the federal gas tax. While Curbelo's supporters are hoping it can gain traction among Republicans, Norquist predicts it's already dead, in part because it would increase federal tax revenues and spend them. Therein lies the crux of the problem for something like a carbon tax. Even if a few token RINOs support it and predict it will happen at some point in the future, if it doesn’t fit into Trump’s agenda now it won’t see the light of day regardless. Whereas past Republican presidents have been malleable to the notion of job-killing environmental excess, Trump not only resists the pressure to bend -- he pushes back. With the weight of public opinion often favoring the environmental lobby’s fad of the moment some Republicans sway in the political winds seeking to appear “moderate” enough to win liberals’ approval. It won’t work. Just like being “pro-choice” on abortion earns no love from Democrats and leftists, sponsoring a carbon tax won’t work either. The partisan divide is just too great these days. All Republicans would be better off selling conservative ideas to win converts rather than going along with liberals in hopes of gaining acceptance. If you don’t believe it, just ask Arnold Schwarzenegger. He spent the final years of his tenure as governor trying to appease California liberals on the environment and abortion. He failed, and so will Curbelo and any other Republicans dumb enough to go along with him. This isn’t to say conservatives are against all new tax-related ideas. Far from it – innovation is the key to reforming government. Texas Senator Ted Cruz understands this and that’s why he’s proposing a means to improve education at the most basic level. Missouri Treasurer Eric Schmitt wrote at the Washington Examiner, “The comprehensive tax reform package passed by Congress last year included an amendment that expanded tax-advantaged 529 savings plans to include K-12 tuition at public, private, and religious schools. This represented a monumental and positive shift for 529 plans, which were previously limited to higher education expenses and had gone 20 years without any major policy innovation. “With the introduction of Sen. Ted Cruz’s Student Empowerment Act, Congress has yet another opportunity to expand and strengthen 529 plans across the country. This bill would expand eligible expenses for K-12 students to new categories like tutoring services, testing costs, and textbook purchases. It would also grant homeschoolers with equal access to 529 plans for their educational expenses and allow the plans to be used by families of children with disabilities for educational therapies. There might not be a subject where conservatives and liberals disagree more than on education. While everyone concurs kids need an education there’s widespread divergence on who should provide it – and who should pay for it. Since Democrats are securely in the pockets of America’s huge teachers unions they’re automatically opposed to any proposals that purport to take decision-making authority out of their friends’ hands. And needless to say, Democrats can’t stomach the beliefs of many parents that their children receive a better and more well-rounded education at home, being taught a rich curriculum by people who share traditional values and aren’t afraid to resist the current harmful cultural trends. Home schoolers instinctively know which bathrooms to use, for example – that’s a good start. Boys are boys and girls are girls…no issues there. All parents should have a say on where (or whether) to send their children to school. Due to the costs of private education it isn’t always possible to afford the alternatives, leaving many poorer families with little or no choice but to dispatch their young ones to the local public school. Due to political correctness and restrictions on discipline a great many of these schools have deteriorated in the past several decades. Inner city residents especially feel helpless when confronting the dilemma. Now there might be hope. Cruz’s effectively named bill would “empower” parents to make the right choice for educating their kids according to their values and personal preferences. Home schooling used to be considered a rarity and abnormal (in some senses) but it isn’t anymore. Many parents I’ve talked with in recent years are so fed-up with public school systems that they’re seriously considering (or have already done it) pulling their children out of them. These families should not be punished for their decisions at tax time either. Tax policy should provide incentives for parents to exercise their options. The government is supposed to serve the people, not the other way around! If our property taxes go to support local schools, they could just as easily be used for private and religious institutions (through vouchers) as well. Many parents would still choose public schools, which is fine. It just shouldn’t be mandatory. Leadership starts at home and kids learn the notion much better from parents than anyone else (this isn’t to say there aren’t a lot of excellent teachers). Government can’t teach morality…though sometimes officials do provide good advice. Maya Lora reported in The Hill, “U.S. Ambassador to the United Nations Nikki Haley kicked off a conservative conference of high school students on Monday by urging attendees to avoid inflammatory language in favor of demonstrating real leadership. Well said. Haley does a fine job articulating and advocating the Trump administration’s views at the United Nations, positions that often aren’t popular with the liberal world community. No matter. Haley’s last suggestion for the teenagers was perhaps her best. “If I can leave you with one message today: Have the courage to stand up to the mob.” Citizens should definitely do the same whenever a congressman introduces an idea that may sound good to the uninformed but isn’t wise (such as a carbon tax). 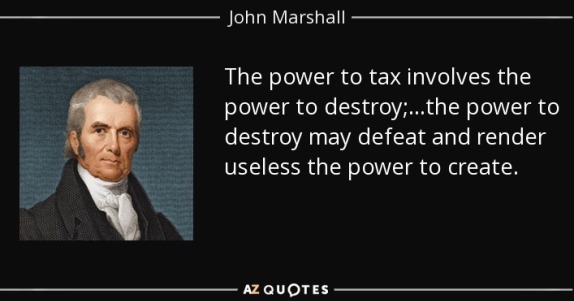 Legendary Chief Justice John Marshall once wrote that the power to tax is the power to destroy – and it’s never been truer than it is today. All Americans pay way too much in taxes – and the government spends even more than it takes in – politicians should keep the lesson in mind.